Craft Montage: DIY Apple outfit for a 2 year old. I can safely say this is the project that did it for me. My first baby step on this crafting journey of mine. 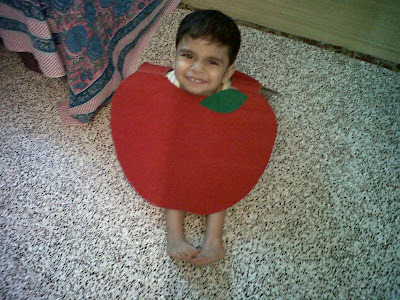 Three years ago, at Preschool my son had to dress up as his favourite fruit. Now who does not want to be the 'creative' mother of 'The Cutest Kid' in school on dress up day? This was the prime motivation. This was a fairly original idea. And I was pretty impressed with how it turned out. All I used was a big paper shopping bag and some inexpensive red and green felt paper from the local craft store. 2. Neatly trim the edge that holds the handle straps. We don't need this end. 3. Make a cut on either side of the bag till the base (This allows you to open up the bag and lay it flat). 4. Base/bottom of the bag is what eventually turns into the 2 shoulder straps. 6. Cut out the apple shape carefully so as not to damage the shoulder straps. 7. Trace the shape of your apple on to the red felt and extra for the shoulder straps. Cut and stick. 8. Cut leaf shape from the green felt paper and stick. Now there is the apple of my eye! PS: If you feel that this is too flimsy, you could just cut out the apple shapes on large cardboards and fix shoulder straps. I did not have much time to plan this craft and I improvised as I went along. I did end up reinforcing mine.